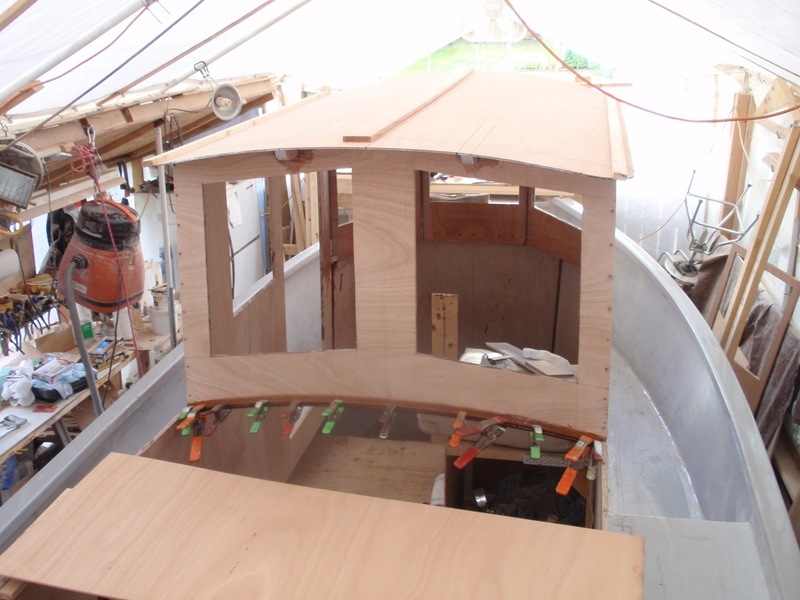 I laminated on the aft cabin top this weekend – the pilothouse roof went on last weekend. 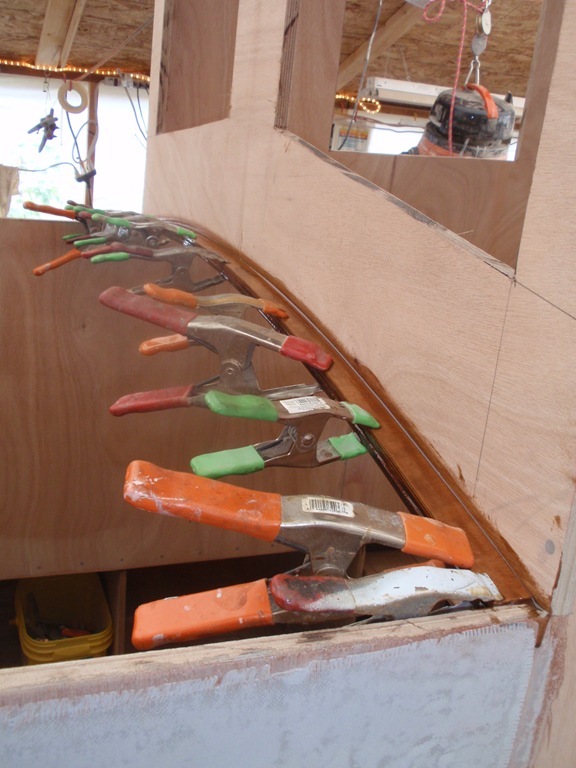 These were the last major structural parts to install – the form of the boat is complete! I mounted the first piece temporarily, traced the contact outlines, and raised half at a time to paint thick epoxy on both surfaces. This way I didn’t have to worry about lining everything up again with wet epoxy all over the place. I finished this side, screwed it down, and then did the same on the other side. After the second layer was laminated on I fastened it down with screws every 10 inches or so. 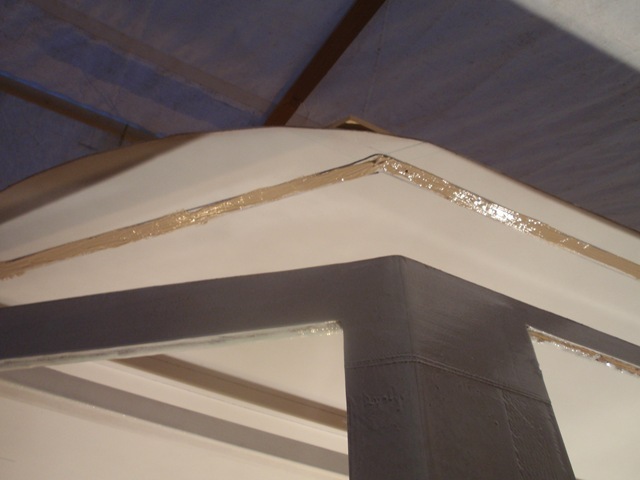 The top layer encapsulated all the screw heads. A couple hundred pounds of dirt provided the clamping pressure. There’s a temporary beam underneath to keep the surface from bowing down. 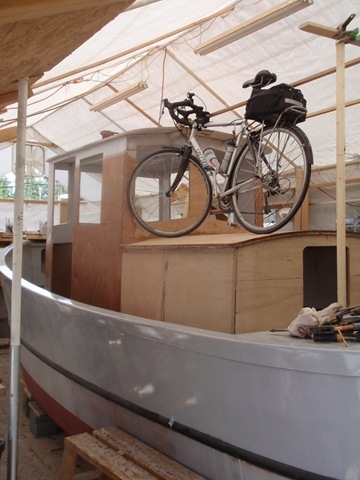 I’m working on a design for a dinghy/bicycle/handrail rack, so I tried out my bike for size. Looks like it will work OK. We like the idea of showing up in Leschi or Olympia and riding around town. 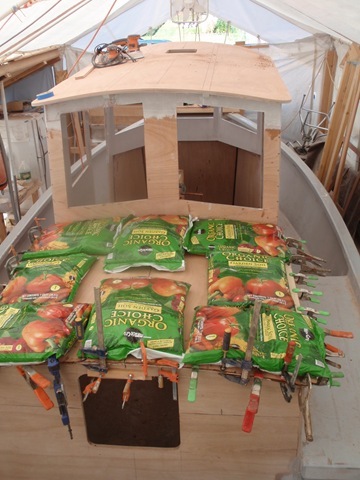 The aft roof has four layers of 1/4 inch plywood. Devlin suggested the additional layer if we plan on walking on the roof occasionally. Also, this roof has no supporting beams. 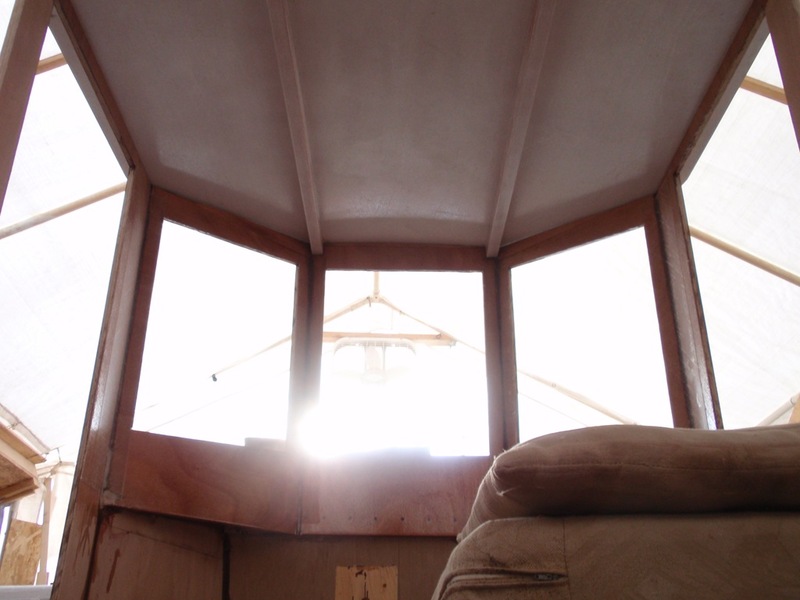 The hole in the back of the cabin is for a Lewmar Ocean hatch. 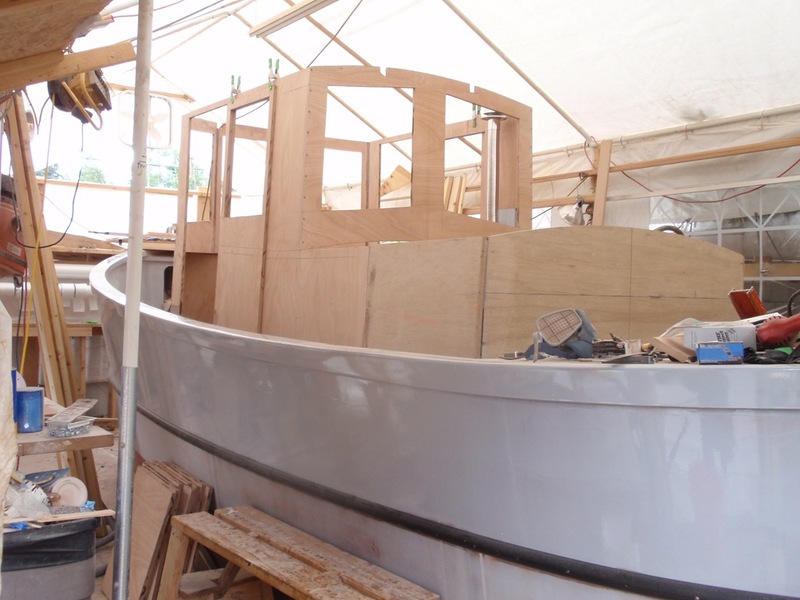 There’s also a small hatch on the pilothouse top, to act as a wind scoop. Now I need to get the outside finished and painted before the weather gets too cold (the gray hull is just tinted epoxy). I’ll spend the winter finishing the interior and installing the electrical, plumbing, electronics, and steering systems. Windows and Doors and Cabin Tops! A long, busy weekend. I took Friday off and got a lot done. I marked and cut the windows and doors. Here’s the last window ready to be cut out. Note the notches for the cabin top beams. 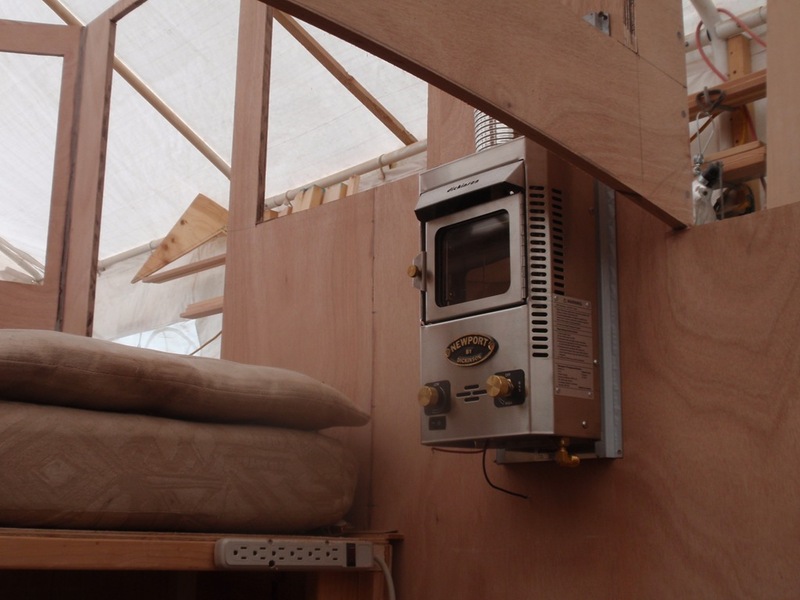 I mounted the heater to confirm the fit, and that I can see the flame while lying in bed. Friday night I pre-coated the underside of the first layer of the top, so I won’t have to do that work overhead. It rained lightly overnight, and the uncured epoxy got all bumpy and gooey. I asked the WoodenBoat guys what to do, with mixed reaction. Most said wait and see, which I’ve done, and it’s starting to set up now. I was hoping to attach the piece this weekend, but in the meanwhile, it’s on top, held on with screws. I still need to remove it and sand and recoat before attaching it for good. The tops are made of 1/4 inch Okoume, in 5 x 10 foot sheets. Five feet is wide enough that I could make each layer as a single piece. I didn’t need to splice or join anything. 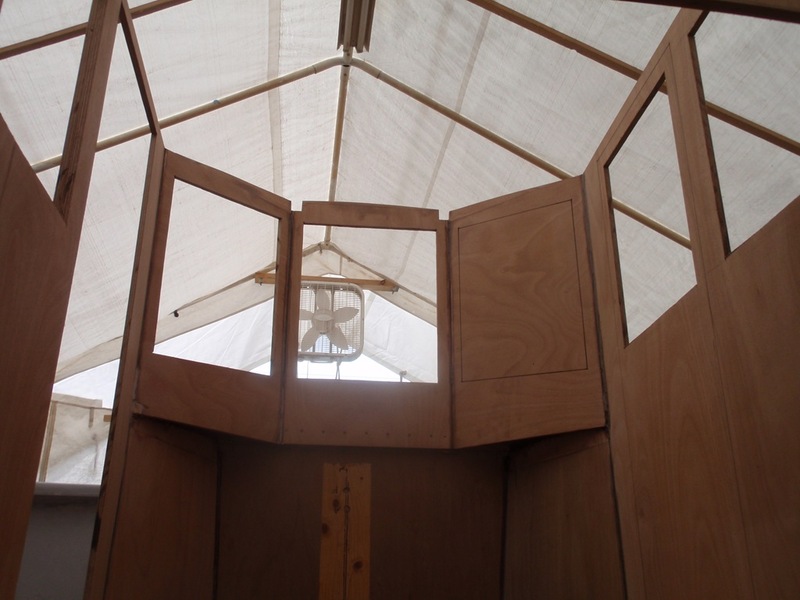 After cutting out the windows, there didn’t seem to be much structure forward, so I added a layer of biax and 6 oz cloth inside and out to all the uprights. 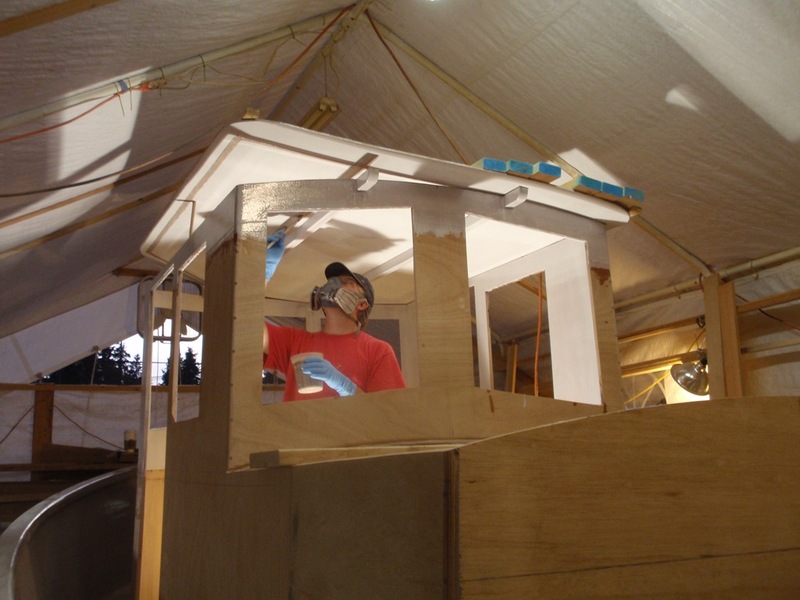 I glued in the roof beams and temporarily added the first layer of the cabin top. It finally looks like a boat! This afternoon I started the aft cabin top by laminating a lip to the bottom of the rear of the pilothouse. This will be the forward support for the aft cabin roof. 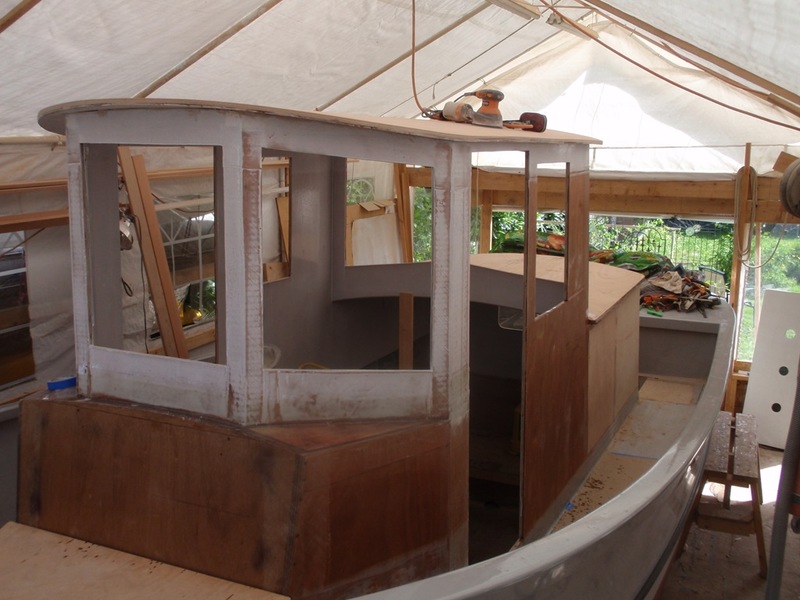 I cut all four layers of plywood for the top, and pre-coated the first one like the pilothouse top. I think I’ll store it inside tonight, just in case ;-). 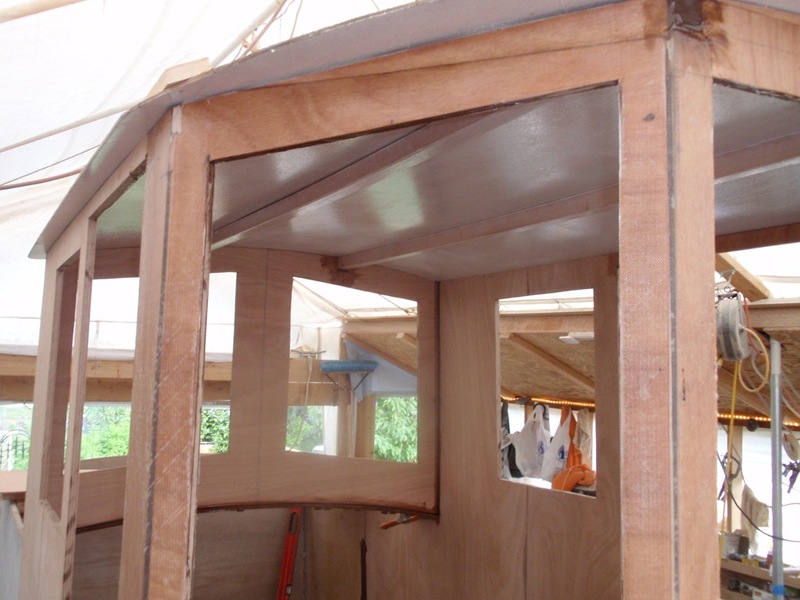 This top won’t have beams because I think we’ll whack our heads on them, so it will be made of four layers of 1/4 inch ply instead of three like the pilothouse top. I’ll add some temporary beams to laminate on top of. 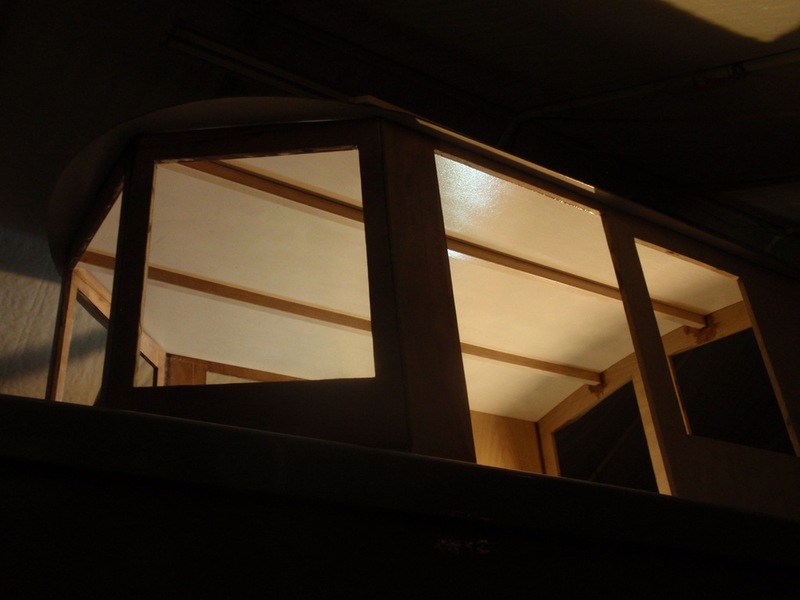 So, next step is to finish the tops, and complete the exterior glassing. I want to do this while the weather holds so I can paint the exterior. I’ll spend the rainy fall and winter finishing the interior.